A rare as hell prototype, made for a punk icon. Tim from Tym Guitars is pretty much Australia’s biggest Ramones fan. He started his whole guitar making career making himself a guitar like Johnny Ramones MkII Mosrite. He ran the annual Ramone-athon for 10 years, raising thousands for charity. Hell, he’s even played a gig with Marky Ramone drumming for him! Anyway, one day Tim emailed a photo of a guitar that he’d been offered to buy from a Mosrite collector named Adam, who’d found it in a pawn shop in Tokyo! My eyes nearly fell out onto my desk when I saw what it was. 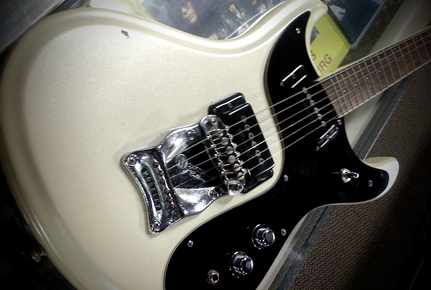 It was the mythical, made by Semie Moseley, totally official Ramones Mosrite. Not one of the Made in Japan, Mark II copies with the Ramones logo… the real deal. And then a few months later, he found another one! Serial number 001. At this point I nearly cried. I’d only knew of these as Johnny had played one on the I Don’t Want To Grow Up music video and I had to find out what that awesome Mosrite was. The story is that Semie Moseley realised that the biggest proponent for Mosrite guitars in the 80′s wasn’t the Ventures & Nokie Edwards, but some skinny, long haired guy from New York who played offensively loud music in a band called the Ramones. And it wasn’t just any Mosrite. It was the Mark II Ventures model, a guitar Semie was so ashamed of he only made about 60 of them before selling them far across the other side of the country so that no-one would ever see them in California. This wouldn’t do. 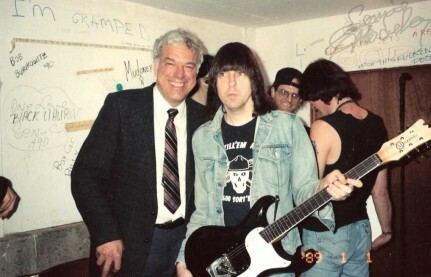 If this Johnny Ramone fellow was going to play a Mosrite, he was going to play a real Mosrite… not some discontinued student model. It’s not known how much input Johnny actually had in the design of his signature model. It is COMPLETELY different from his #1 Mark II model. Instead of a slab body, the guitar had the famous Mosrite German carve running around the edge. And the body is hollow. Tim showed me the seam running down the sides of both his guitars, where Semie had split the body in half, routed out the insides, and glued them back together. When you tap your finger along the body, it sounds like a Rickenbacker. And when you strum it, it has that banjo-ey sound you get from thinline hollowbody electrics. There were 2 different models. 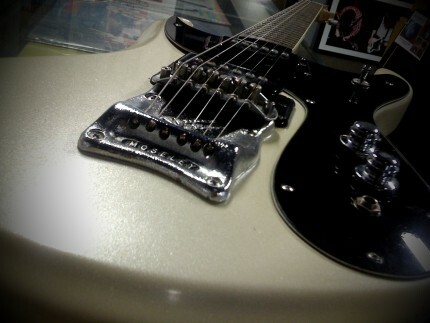 The single pickup model as played by Johnny, as the twin pickups that Tim has. 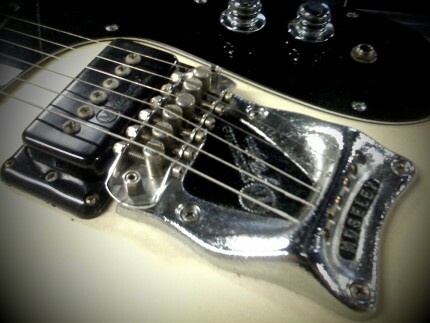 In another departure from Johnny’s original MkII, Semie used standard Mosrite pickups as found on the Ventures models, which sound NOTHING like the Dimarzio Fat Strat pickup Johnny had used in his MkII. The bridge is Semie’s solid cast model that was found on his Ventures model. While this certainly does the trick, it’s very different from the stop tailpiece Johnny was used to. Another major departure is the neck. The necks on real Mosrite Mark II’s are toothpicks. They’re tiny and very narrow. I tried playing some Ramones riffs on Tim’s original blue MkII and my fingers couldn’t reach in enough to make barre chords. The neck on this guitar is straight off the Ventures model. It’s a lot wider and feels totally different. Not sure how Johnny would of felt about that. It’s a great feeling guitar, though. The fact Johnny played it a few times showed he at least gave it a try. The funniest thing is that Semie had misspelled The Ramones on the headstock. 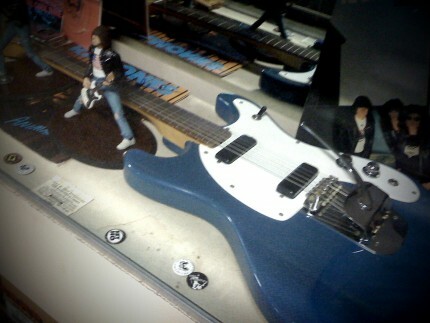 He called the guitar The Ramone’s Model. 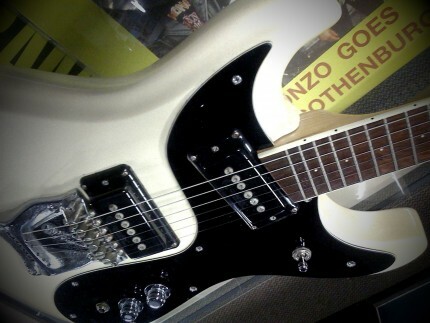 The colour of this guitar is a gorgeous pearl white, reminiscent of the 60′s Ventures models. It certainly makes this guitar a little more special… if that was possible. From what Tim can find out, only 2 one pickup and 4 or so of these double pickup Mosrite Ramones models were made before Semie died. This one is #1, and Tim’s blue one is #3. Both were found in Japan, so the theory is that the whole run went to Japan before production was to begin, which unfortunately ended with Semie’s passing. 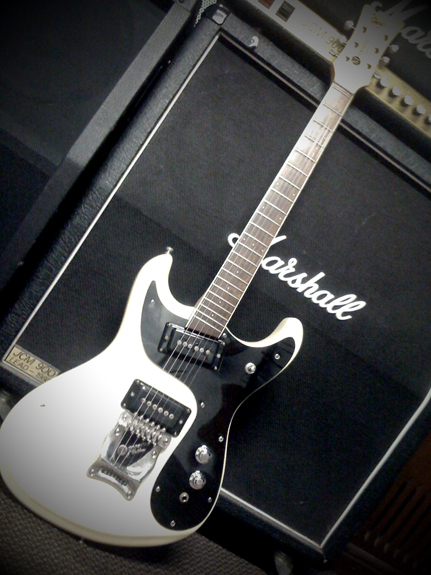 The full story of this guitar is in this Mosrite forum entry written by Rocco. 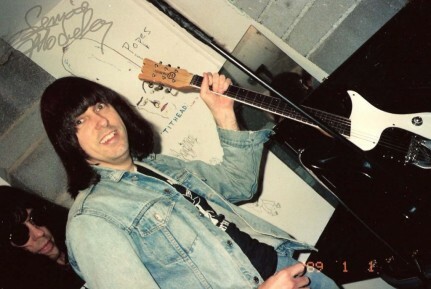 Tim’s white Ramones model has Semie’s writing on that neck, so that’s definitely a Semie built guitar, while this guitar was ordered in 1997, 5 years after Semie’s death so it must’ve been made up from left over parts. After receiving the guitar, Rocco tried to work with the remnants of the Mosrite company to release a batch of these Ramones guitars to the market… the initial press release can be read here. Unfortunately it all went pear shaped from there and it never happened. Full details are in Rocco’s Mosrite forum message. So from what I can find out, 2 single pickup Mosrite Ramone’s Models were made, one white and one black, both built for Johnny by Semie. 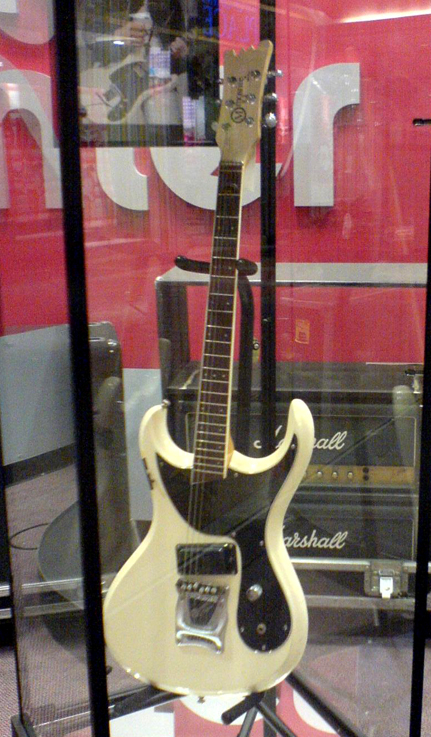 The black model was then given to Danny Sage by Johnny. 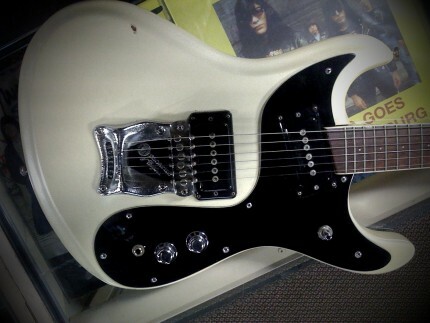 *Edit: Tim from Tym Guitars just sent me this photo and info of Johnny’s white Ramones model. Apparently it’s on display in a guitar shop in NYC, along with some Ramones memorabilia. 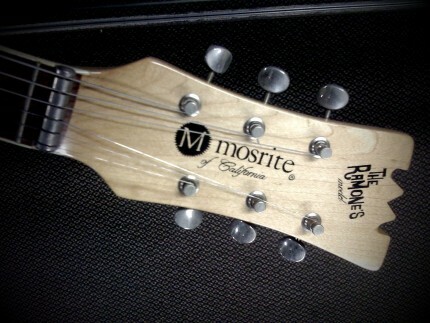 The interesting thing with this guitar is that it has the later ‘Mosrite ’88′ type logo, instead of the classic logo as found on the 2 pickups models shown. 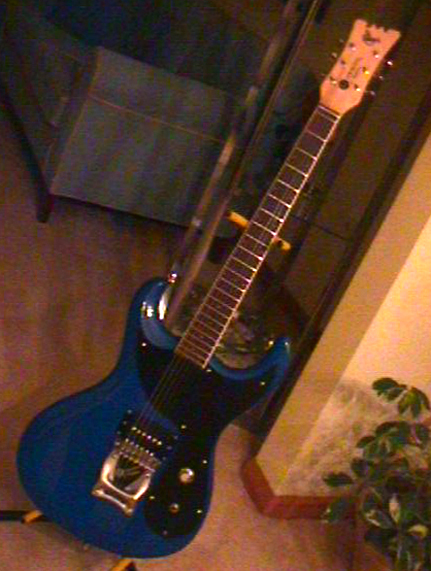 Also, unlike Rocco’s later blue version shown above, Johnny’s has a slanted pickup with no pole pieces, with the pickup slanted toward the treble end. So in theory this would add more attack & less bass. Not sure if this was intentional of if Semie was following the angled neck end to make it look all nice and stylish. Anyway, that’s all I know of these guitars. If anyone else has any info, please write in. **Edit: Yowza! Thanks to Adam for these AMAZING pics of Semie and Johnny Ramone! Looks like Johnny is receiving his black single pickup Mosrite Ramones. I’ve never seen it with a white guard, I think Johnny may have changed it to black later on. And it looks like CJ has just received his white Mosrite bass that he played in the ‘I Don’t want to grow up’ video in the background and is showing it to Joey. He looks pretty happy about it too! Also, I just noticed that the scratchplate on this black guitar is very Les Paul Jr like, and is missing the ‘sharkfin’ like on the other examples I’ve seen. Hey this is a great site and I was particularly happy to see one of the Johnny Ramone figures that I produce included in one of the pics. only one thing to say about mosrite / the sellers n makers of the reproductions including mosrite have taken full advantage of johnny ramones death by jacking up prices a 1000 percent since 2005 n what makes mosrite worth 5000 to 8000 dollars any way if johnny ramone would have bought a gibson that day in 74 mosrite wouldnt even have exsisted. 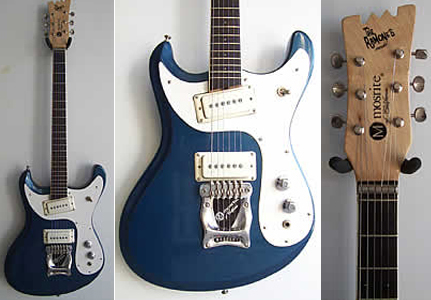 Looking to buy a new Mosrite Mark 2 Delux. Heard they are going to reproducing them soon. Hey Bill Webb. Where can I buy one of your JR figures? They rock!